Contrary to popular belief, rural churches do not have to live on the island of fax machines and flip phones (not that there's anything wrong with those). 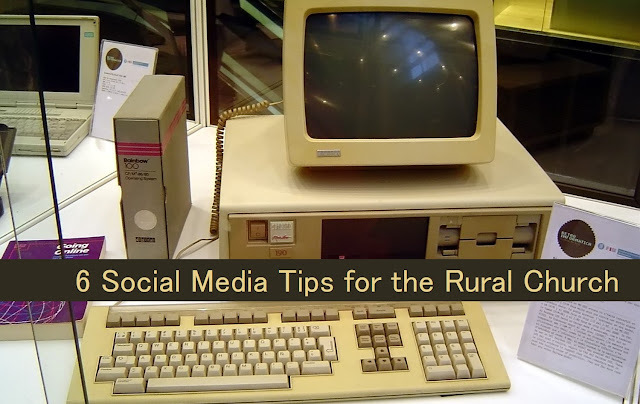 Skinny jeans might still get you laughed out of town but a well done social media site can help you travel every dirt road and cow path without ever leaving your desk. Keeping up a trendy social media presence can be confusing for so many, while seeming like the most natural thing in the world for someone else. It is even more finicky for churches who are trying to strike the right balance with their social media content. In light of this, I plan on doing an informal series of advice posts to help you navigate some of the issues and avoid some common mistakes. Send me your questions, and I will try to get to them in future posts as well! You read in a book somewhere that all the trendy churches are using Twitter, but your church page has 3 followers and you’re pretty sure one is a fake person? Your time is valuable, and this is all about efficiency. Figure out which social media sites your local population is using. For us, it is currently Facebook with Instagram on the rise. Our church has a Twitter account, but we don’t spend much time updating it because we have very few local followers. I try to split my posts 50% informative (i.e. church events, service reminders, etc.) and 50% educational or encouraging. You want to keep people coming back – even if they aren’t regularly attending your service yet. Announcement posts keep your members engaged and connected while non-announcement posts keep you on everyone else’s radar. We have a regular audience of community people liking and sharing our church posts that never come to service yet they keep connecting with us online. These percentages can vary during certain seasonal activities or periods without events, but just make sure that your next visitor doesn’t scroll through your site and see 53 posts that were extruded from the same mold over and over and over and over again. The other day someone older than me lamented that they were going to have to delete and restart their Facebook account because it was too dramatic. I informed them that you can control almost everything you see. Don’t like someone’s content? Hide them, unfriend them, or block them. Unfortunately, the same is true for your church pages. If you start posting random junk five or six times a day, you’re going to get dropped like a greased-up pig. Leave them wanting more. If you do post often: raise the quality bar. Celebrities and presidents can get by with it because people are eagerly awaiting their next move. People will check your social media before they visit your church. Make sure there is a pulse, because dates don’t lie. Unlike your website which can be generic enough to stay relevant for months, if you haven’t posted on your social media since that big Christmas Eve service, everyone can see the glaring DECEMBER 24 and they will wonder what has happened to you since then. This often happens when someone in charge of social media leaves or steps away from the role. Make sure they are replaced or get a select few hand-picked people to form a safe and reliable team to get the job done. The internet works both ways. Become the visitor, and peruse the social media accounts of other churches. Take note of what you like and what you don’t. What would make you want to come back? Before long, you will become the teacher, and they will [hopefully] be getting their next great idea from your wall! Next time: I’ll talk about how different types of social media sites distribute your content differently and answer the question of why everyone is not seeing your posts. I’ll warn against getting into culture and theology wars while logged into the official account, and we’ll also talk about…wait for it…timing.